N.B. All of the following post was written BEFORE I watched the great vlog from Silhouette Patterns entitled ‘Armholes & Sleeves’. Never again will I have to suffer the trials and tribulations presented by this project. Happy stitching! 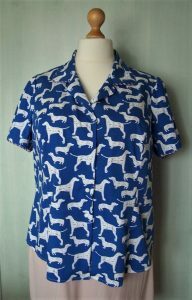 At the end of the previous post about this shirt I was considering conversion to a sleeveless option. In anticipation of going that route, I therefore carefully removed the offending sleeves (noting that the seam allowance would now be ¼ inch only) and prepared a long length of self-bias ready to bind the armholes. I tried on the shirt and it would be ‘OK’ sleeveless but not what I really wanted. If I went down the sleeveless route there was a strong chance of flashing my underwear as the armholes were large and deep. 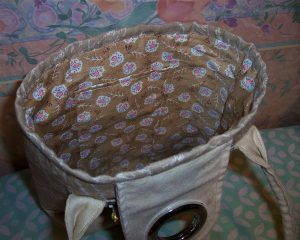 I recalled that I had some remnant fabric from making a bag a couple of years ago – would I be able to locate the extra fabric and could I make some new sleeves? I went on a ‘treasure hunt’ through my boxes of fabric and was most fortunate to find a large piece (about 1 yard of full width) of the printed cotton. Right – let’s get this show on the road! With the shirt modelled on the dress form I measured the gaping armhole. It was approximately 9 inches across at the cap, 9 inches deep. The front armscye was 12 inches and the back armscye 14 inches. I retrieved the original sleeve pattern from the envelope and traced onto pattern paper. 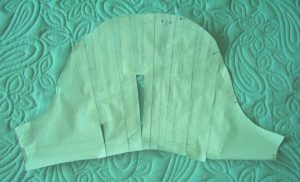 Now, I needed to expand the sleeve cap to at least 9 inches width and lengthen the front and back armscye lengths – plus seam allowance. To do this, I slashed the pattern in several places from the head down almost to the hem and then cut up from the hem leaving a ‘hinge’ to pivot as I spread the pattern. The ‘hinge’ area was reinforced with magic tape. Each slash was spread by ½ inch and then taped to spare paper on the reverse. This expanded sleeve head would be gathered to fit the armscye and should provide sufficient room for easy movement of my arm. I cut two sleeves using some soft calico from Lady Sew & Sew of Marlow (my ‘go to’ supplier for great calico) and hand basted them into position. Oh so much better. I needed to reduce the ‘expansion’ by 1 inch on the front armhole and the length of the sleeve but overall it looked ‘good to go’. 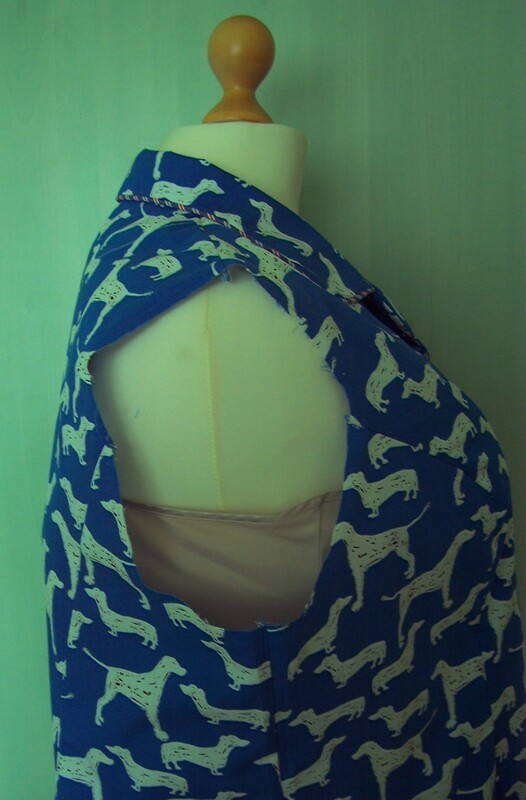 I unpicked the toile sleeves, pressed and used them to make a new pattern. 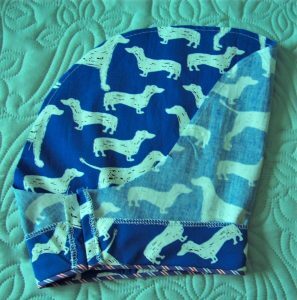 Taking care to ensure that I cut each sleeve with the pattern running in the correct direction (I did not want dogs standing on their heads!). As the hemline of the sleeves was now a gentle curve, I decided to repeat the contrast striped bias piping along the hems. Having completed the preparation of the new sleeves, I inserted with hand basting to double-check the fit. Not perfect but a vast improvement on the first versions so I proceeded with machine stitching. Due to the narrow seam allowance I had to take great care when neatening the raw edges with the overlocker. All done so now I can enjoy my new shirt and get on with the next project. Something a little less taxing in the fitting department! Eureka moment for sleeves and armholes! How I wish that the vlog by Silhouette Patterns entitled “Sewing Tutorial – Armholes and Sleeves” had been available to watch earlier in my sewing career. The vlog was released a few hours ago on Tuesday morning. This episode covers the relationship between armholes and sleeves and helps to clarify how to make everything fit just for you. Just 10 minutes of inspiration that I hope and believe will revolutionise my approach to armscyes and sleeves for the future. 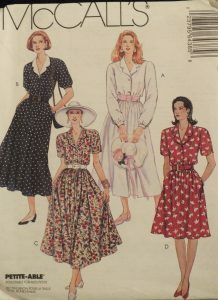 Whilst I regularly ‘hack’ my dressmaking patterns by changing necklines, fastenings, skirt styles, sleeve lengths, finishes and collars, I have never considered transferring armscyes and sleeves from one pattern to another. If you have ever encountered problems in this area of your dressmaking I urge you to watch the clip. I intend to audition all my recent dressmaking to identify and copy the perfect armscyes and sleeves for the four main styles:- sleeveless, knit tops, woven tops and jackets. I will let you know how I get on as I have a full programme of dressmaking planned for June that will include knits, wovens, dresses, tops and jackets. Happy stitching! 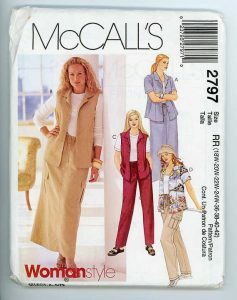 This version of McCalls 2797 is now Out of Print but I managed to find a replacement to my very well-worn and tatty original pattern on etsy.com. I wanted to revisit this style but could not find any of my original adaptations and fitting adjustments. I would need to start again from the beginning. First, measure myself and compare with the pattern’s stated measurements. 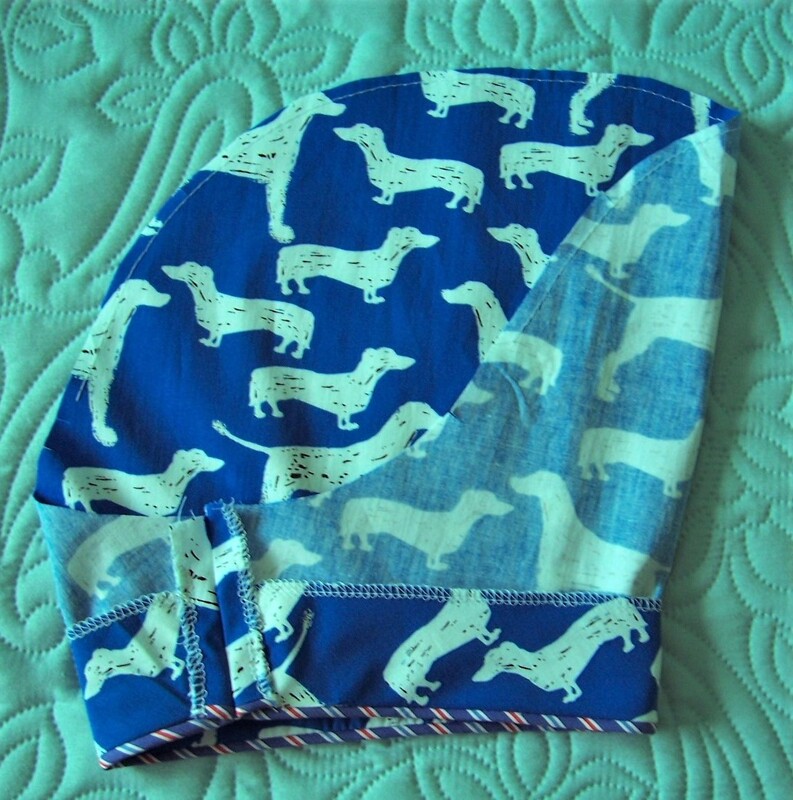 That done, I chose to make this ‘wearable muslin’ from a length of Bright Blue background dog print cotton fabric purchased at New Threads Quilt shop, Weyhill Fairground, sometime last year, or it may even have been 2015! So this project is definitely part of my stash-busting resolution. The fabric had been laundered and pressed ready to get making a new shirt. I would be making View A and cut an 18 at the shoulders before grading out for bust, waist and hips. I made no changes to the length of the bodice or the sleeves. The construction of the shirt was very straightforward. Panel and shoulder seams were stitched and overlocked. The neckline was stay-stitched and a label inset placed at the back neck. I wanted to add some definition to the collar and for this I used a strip of striped bias fabric made into narrow piping. 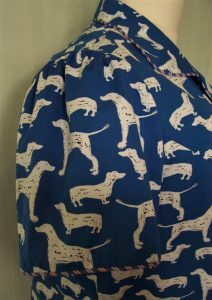 The fabric for the piping came from an old pyjama jacket of my husband’s – definitely re-cycling! In order to make piping the outer edge of the collar easier, I rounded the sharp point using the base of my pencil sharpener as a guide for the curve. The collar was completed and attached to the neckline. Next I attached the facings. 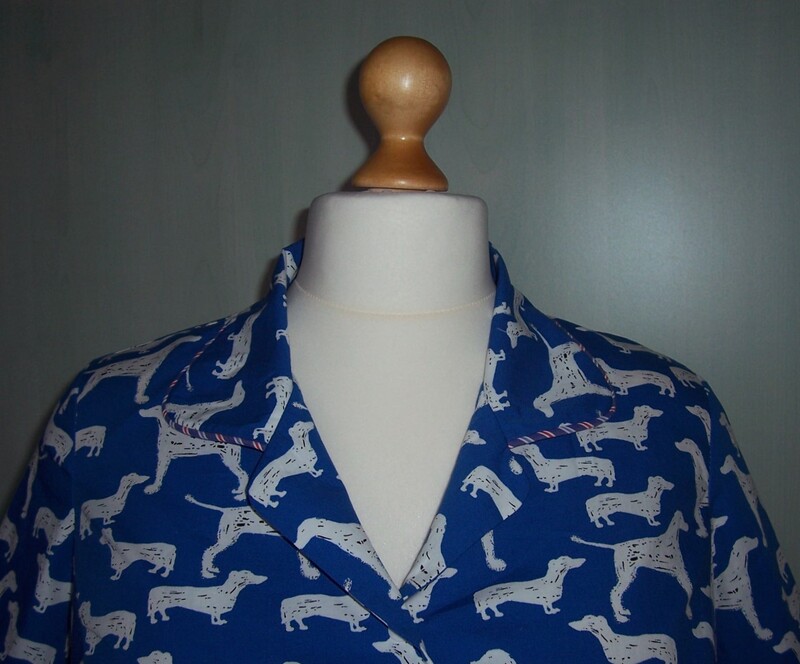 The pattern calls for the facing to be cut from the same pattern piece as the central panel of the shirt but I thought this would be too substantial for a Summer garment and therefore drafted my own facing piece. I drew a line from 3” along the shoulder seam curving gently over the bust area and then 3” wide down the front edge. 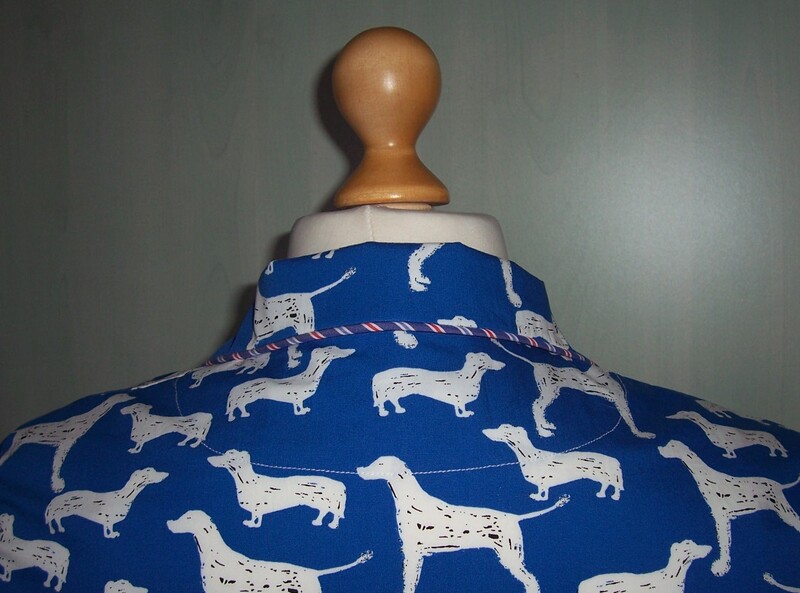 Both the collar and the facing were interfaced with medium weight fusible interfacing. For the side seams I took the standard 5/8th inch seam allowance but when I tried on the shirt found that it was too tight around the waist and hips. I unpicked the stitching and re-sewed taking a bare ¼ inch seam allowance thus providing an additional 1 inch of ease. 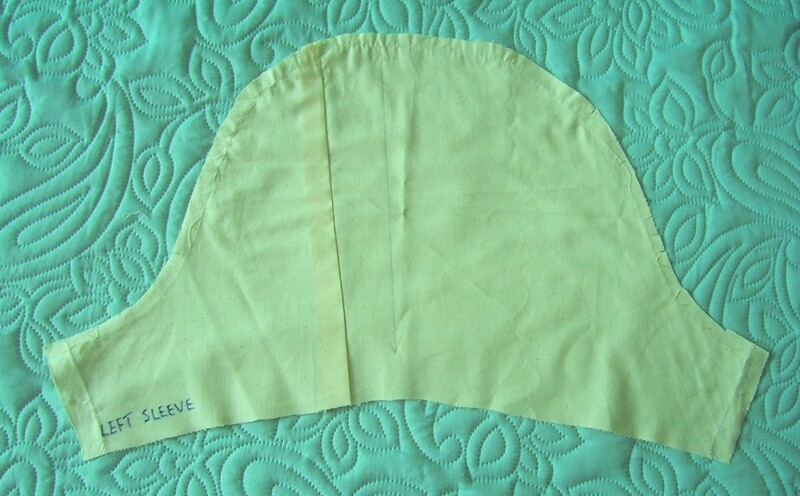 The sleeves were prepared with a 1 inch machine sewn hem prior to insertion. Insertion of the sleeves was straightforward and I finished off the construction by overlocking and machine stitching a narrow hem for the bodice of the shirt. As a new feature for me, instead of traditional buttons and buttonholes, I used 5 White plastic poppers to fasten the shirt. Now for the finale – oh dear – I should have had a fitting with the sleeves tacked in place. They were much too tight and it was like wearing a straight jacket! The shirt rode up at the back neck and the whole thing was uncomfortable to wear. Also, I noticed that my bust was pulling the front hemline up but fortunately as it is shaped this problem is not so obvious as the sleeves issue. I am pondering what to do to resolve the issue. Probably the best thing is to remove the sleeves, make some self-fabric binding (or some more of the contrast stripe?) 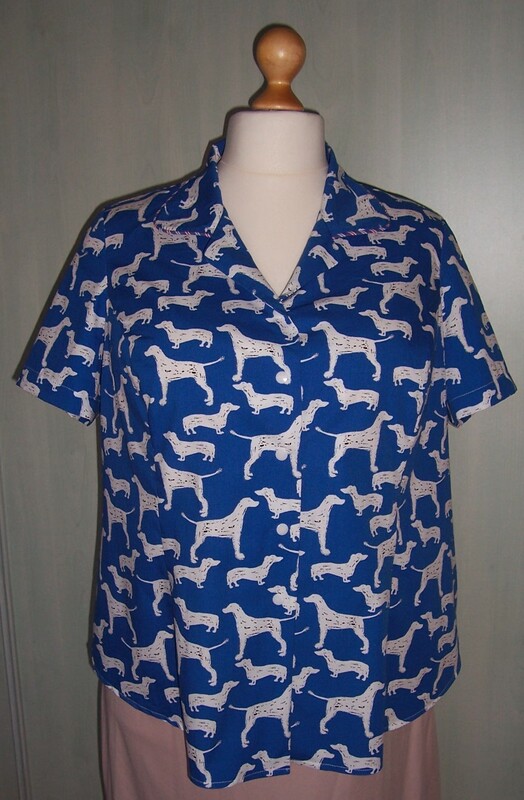 to convert the shirt to a sleeveless over-blouse. Watch this space…… in the meantime, I have re-drafted the sleeve and the front centre and side panel patterns to account for the raised hemline. Before I use one of my ‘special favourite’ fabrics to make this style again, I think it will be best to try another ‘wearable’ muslin. When the month of May comes around, the Sprat & Winkle Quilters enjoy a ‘Retreat day at Rookwood’ when we get together and make a project. 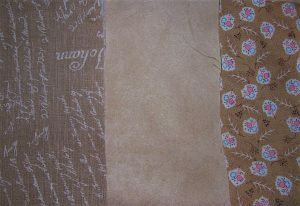 On previous occasions we have made jelly roll quilts and reversible bags. This year the project was a ‘Twisted Pole Table Runner’. The day starts as we unload our cars with ‘stuff’. The fabrics, sewing machine, mini iron and essential sewing tool kit, crockery and cutlery – not forgetting a large mug for the endless cups of tea(!) and a contribution for the lunch and afternoon tea. We set up our workstations and then Lizzie ‘Head Girl’ introduced the programme for the day and the project(s) that we will undertake. The table runner is made from a vertically repeated basic block which is then outlined with 2 borders. The block is a simple one made entirely from half-square triangles. 2 x 5” squares with a diagonal line drawn across the middle. Stitch ¼ “each side of the line, then cut apart down the centre of the stitching. Press towards the dark side (sic). After the introduction we scattered to our workstations to get cutting and stitching. At lunch time we downed tools and enjoyed a chance not only to enjoy the fabulous food supplied by the ladies, but also to socialise, to view the various quilts on display, to have a go at the Tombola and to browse the items for sale. Back from lunch, we were set a new challenge. A pack of fabric and instructions was supplied for each of us to make a disappearing 4-patch block. The blocks were then ‘raffled’ and the winner received all the blocks to make up into a quilt, we don’t expect to see it next week so you have some time to put it together. Back to work and by the end of the afternoon I had completed the runner top including the two borders of contrasting fabrics. The end of a lovely self-indulgent day and home for a rest! I have now completed the runner with a poly/cotton wadding and calico backing. There is some simple straight line quilting, now all it needs is an embroidered label for the reverse. I think this block design will make a great lap quilt if repeated in columns- watch this space. 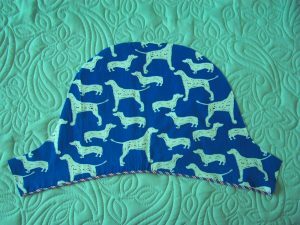 On yet another occasion when sleep has evaded me, I got to thinking about sewing projects. I recalled that I had some leftover sheets of vinyl from when I made the Sew Sturdy Organiser Case (posted 31 December 2016). Surely there was away that I could use them up? 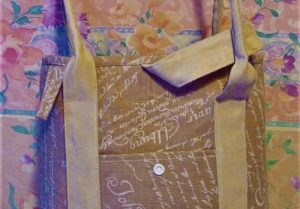 I often have part-completed projects piled up at the side of my sewing desk, how much better it would be if they could be stored in project bags – and how much better if those bags had a clear vinyl window so that I could tell quickly and easily what was in the bag. 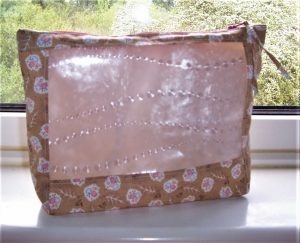 I had a few pieces of the quilting cotton left over from the small Maggie bag project and decided to see if I could make up a window project bag. The sewing machine was threaded with the correct coloured thread and I had a spare zip in Bright Pink that would compliment the colours in the printed cotton. Within 40 minutes I had completed the project bag and I am delighted with it. I will keep it on hand and as soon as I have another ‘window’ (see what I did there?) 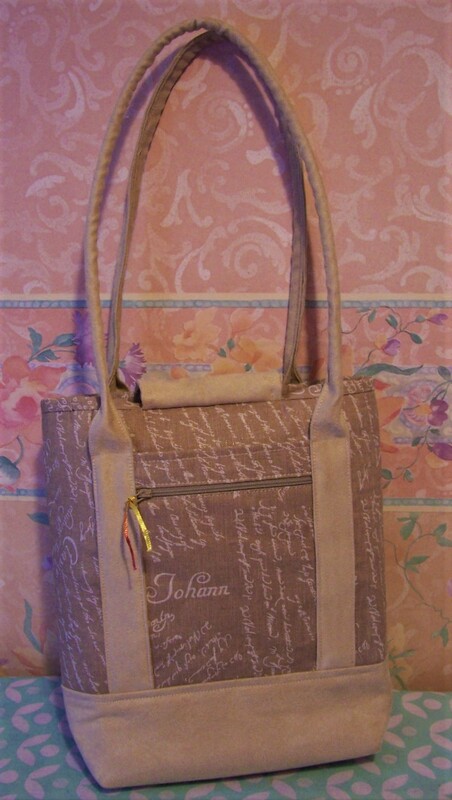 in my sewing schedule will write up instructions on how to make these decorative and useful bags. For the upcoming ‘Maggie’ bag workshop, I needed to calculate the cutting plan for the smallest-sized bag. The best way to do this is to make a bag. It is so much easier to check the proportions when you have an actual bag in front of you. 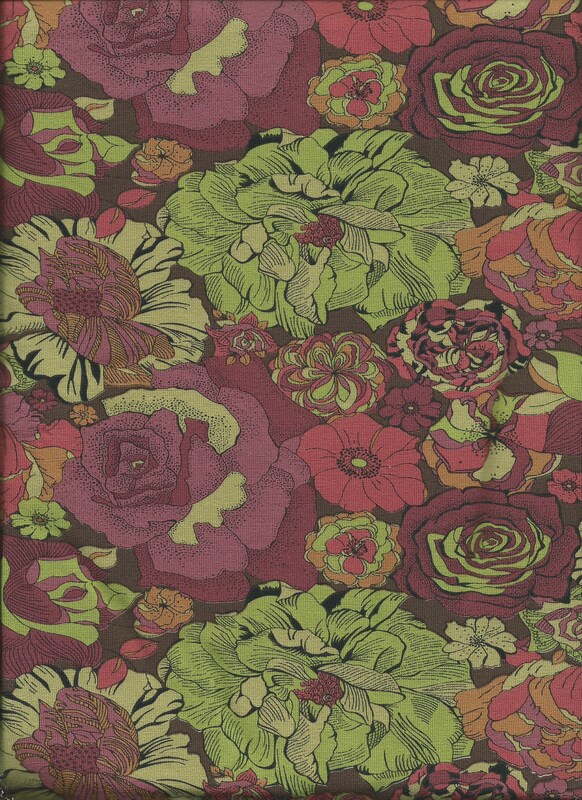 I checked my stash of bag-making fabrics and pulled out a script-print linen from New Threads, Weyhill Fairground, which co-ordinated really well with some faux suede (source unknown). I checked back to the cutting plans for the large and medium-sized bags and then made some size decisions based on those comparisons and proportions. I cut the bottom panel, straps and flap from the faux suede. The top panel, top binding strip, external slip pocket and external zipped pocket were cut from the linen fabric. For the lining I used a fat quarter of cotton print purchased from Fabricland. The wadding was a one-side fusible Bosal ® and the zips for the pockets came from my stash. I did some test stitching and was a little concerned that the faux suede was a real b….. to sew. But hey ho – onwards and upwards! 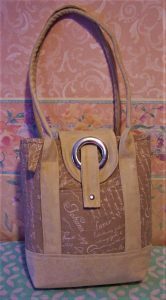 I decided to go ‘off plan’ with the flap which for the other bags in the range have a twist lock. 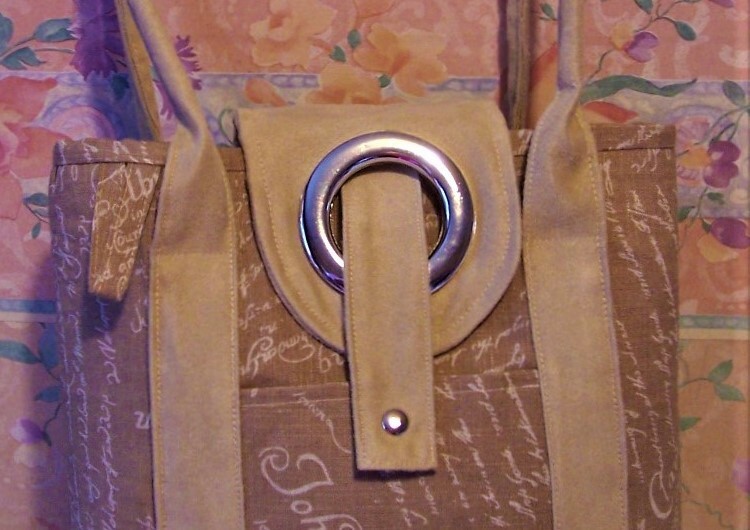 This bag would have a circular grommet on the flap which would then be fastened by passing through a strap which would be secured with a popper. 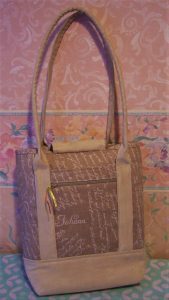 The construction of the bag was fairly straightforward with only a few minor adjustments to the dimensions of pieces which were jotted down ready for a new cutting plan. The finished bag measures 10½“ high x 7½“ wide x 2¾“ deep and was just about completed when I thought the long handles look a bit floppy and unsubstantial. I decided to try inserting some piping cord – a method that I had seen on bag patterns from The Bobbin Patch. It would have been easier if I had planned ahead for this! 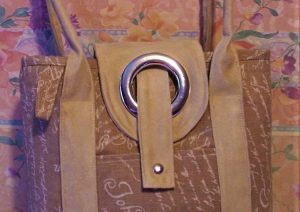 By using the zip foot and some ‘gentle persuasion’ I managed to stitch the cord inside the folded handles. They now look much better and more in proportion to the rest of the bag. This method for handles is something that I will be using again on other bags. Next time I will make the straps a little wider so that I can use plastic tubing for the insert and thus avoid the ‘crinkles’ caused by the piping cord. 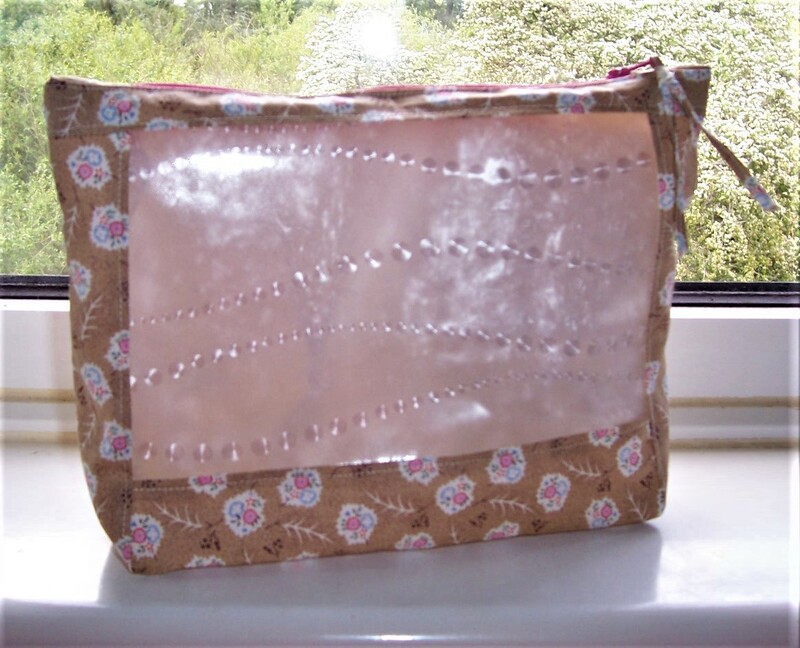 On the whole I am pleased with the resultant bag although I am not impressed with the fusible Bosal ® which tends to leave a ‘dimpled/cellulite’ finish if you are not careful. I much prefer the sew-in version and will make a point of stocking up with some more as soon as possible. I picked up this pattern because I was attracted to the unusual collar which is gathered into a V-neckline. 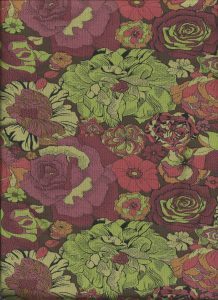 Whilst at Franklins I was also drawn to an Autumnal printed jersey fabric on sale at £9.95/m less my special 10% discount. I bought 1.5m and by the end of the afternoon the fabric had been laundered and cut out ready for stitching! A previous Kwik Sew pattern that I made up came out too wide at the shoulders for me, so this time I used my High Bust measurement and copied off the size L (40-41½” bust) and graded out for my full bust and rubenesque hips. I also measured the sleeve pattern and reduced by 3” (I have very short arms! 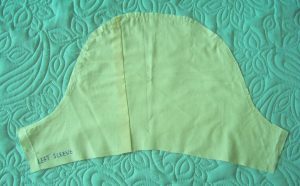 ), the bodice was left at the same length. I made sure to mark up the pattern pieces that there is only ¼ inch seam allowances for this pattern. I sat down with every confidence that this pullover top would take about an hour to stitch together. Wrong! Having changed to jersey needles in the overlocker and threaded up with 4 threads, I was unable to achieve a satisfactory stitch. After about 3 attempts I finally managed to resolve the tension issues and was able to produce a great stitch. After that little hiatus, things went very well. The gathering for the front of the collar was fiddly, especially as this particular jersey fabric was fine and very stretchy. I managed it by basting on the sewing machine. 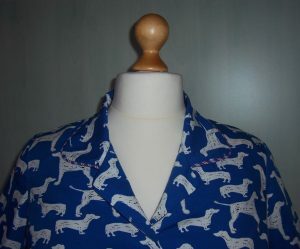 I had already decided to ignore the faux button loops as I thought the print on the fabric was busy enough without adding extra ‘enhancements’. At first fitting everything was fine except that the top was over long. I made a 1½ inch hem on the bodice and the same on the sleeves before top stitching with the twin needle. Although I originally envisaged this top as a garment for the early Autumn, with the current chilly, wet weather, I shall be wearing it over the next few days until Spring/Summer weather returns. Also, now that I have ‘trialled’ the pattern, later in the year I will be making more in a heavier weight jersey for the ‘real’ Autumn and Winter seasons. Of the two Maxi-sized ‘Maggie’ bags, I am not sure which one I prefer. 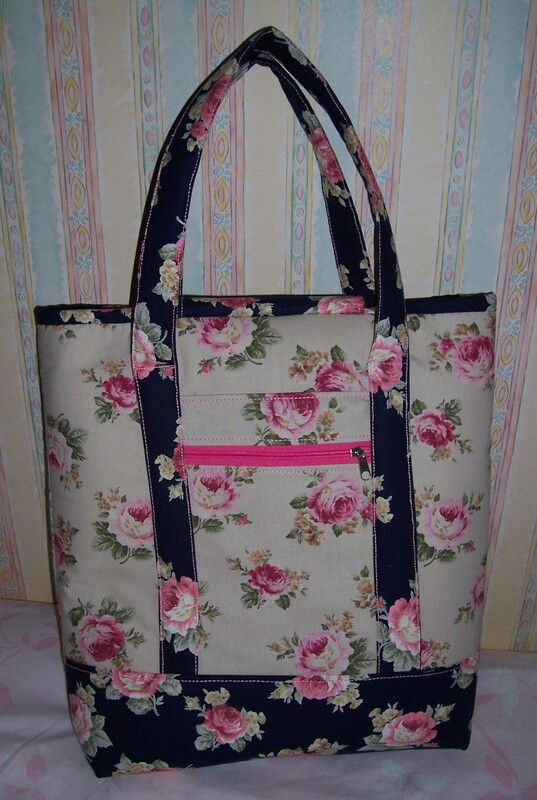 Having made this second bag using fabrics bought at New Threads Quilt Shop, Weyhill, I can foresee that this will be very useful throughout the Spring and coming Summer months. Florals are definitely my thing! I will reserve the ‘Hares’ printed bag for use in the Autumn. 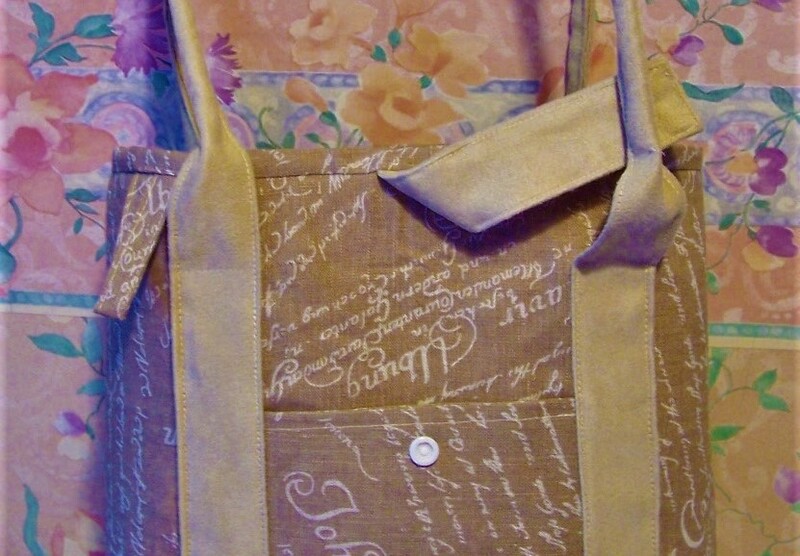 I wrote quite extensively about this bag when I first made it in the ‘Hares’ fabric so will not repeat myself. 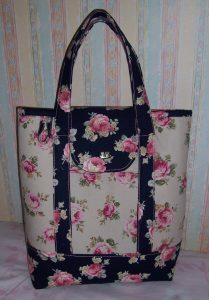 Suffice to say that having previously written up all the instructions complete with cutting plan, this bag went together very much more quickly than before. I am particularly pleased with the contrast Pink top stitching. For that I used the triple stitch feature on my machine and made the stitch length 4.5. 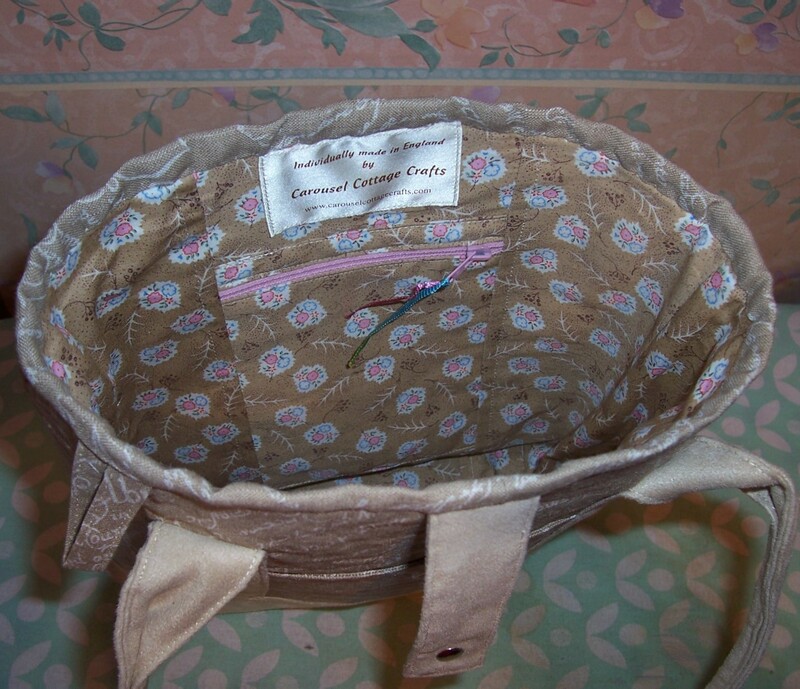 I have already drafted and made up the ‘medium’-sized Maggie bag which appeared on the blog sometime ago. 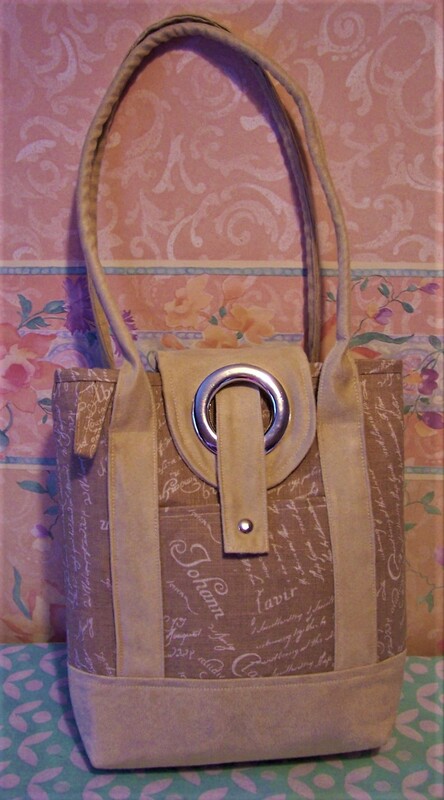 All that now remains is to calculate and make up this style of bag in the smallest size. 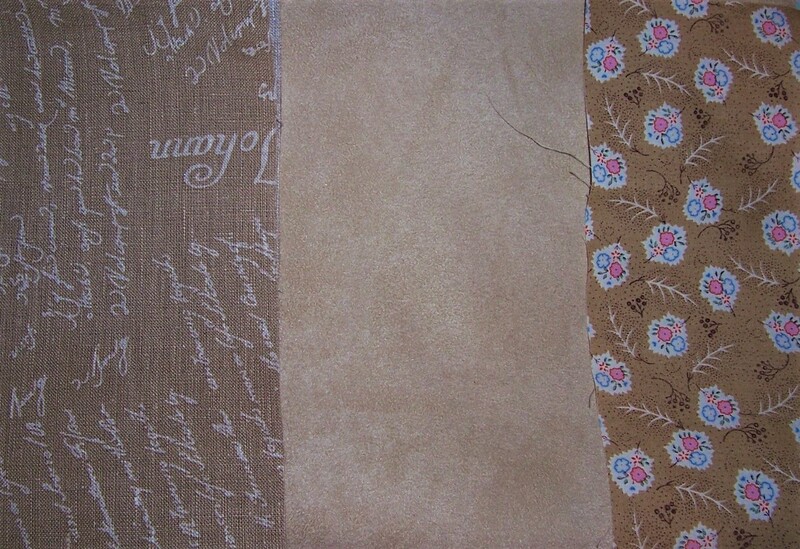 I still have remnants of the Blue & Beige floral linen-look fabrics so hope to be able to use them for the final project. Chickens on Tan Stripes Blouse – but still no love! 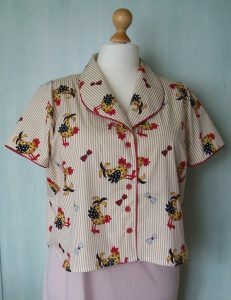 Well I must say that I am pleased to get that blouse finished! 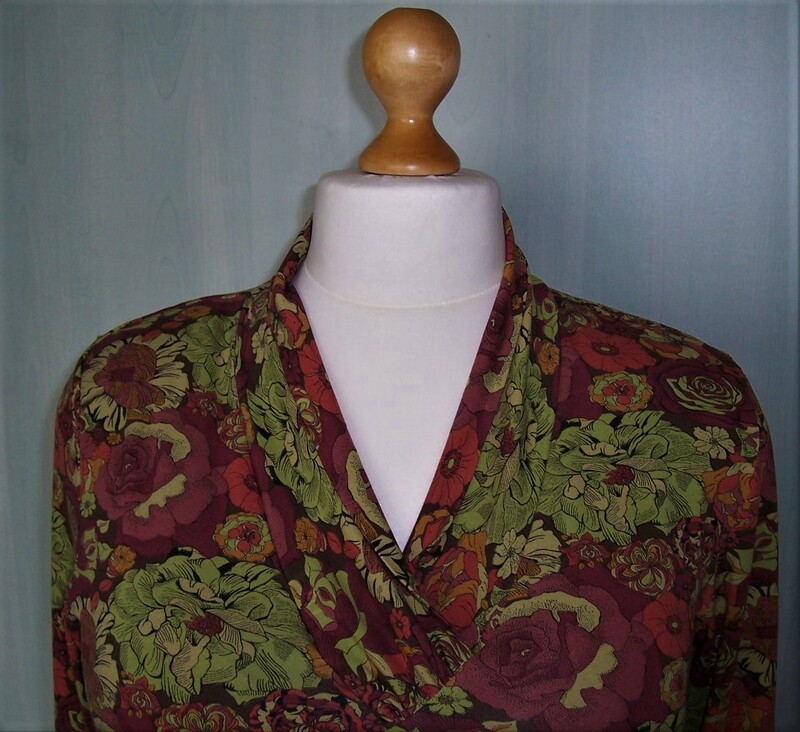 Currently I am struggling with sewing woven fabrics and having recently ‘acquired’ some extra weight, find that I need to make a few new blouses and tops, especially as the days are getting warmer. 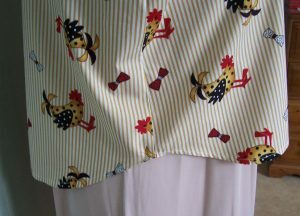 I was browsing through my cotton fabrics when I came across this 2 metre length of the Chicken and stripes print that was purchased from Fabricland in Salisbury some time ago, (does this count as using up some of my stash?). 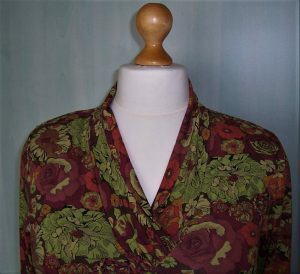 The previous ‘Chicken’ blouse had a classic revere collar which I found was ‘fiddly’ to stitch, so this time I opted for a shawl collar which should be less time-consuming. 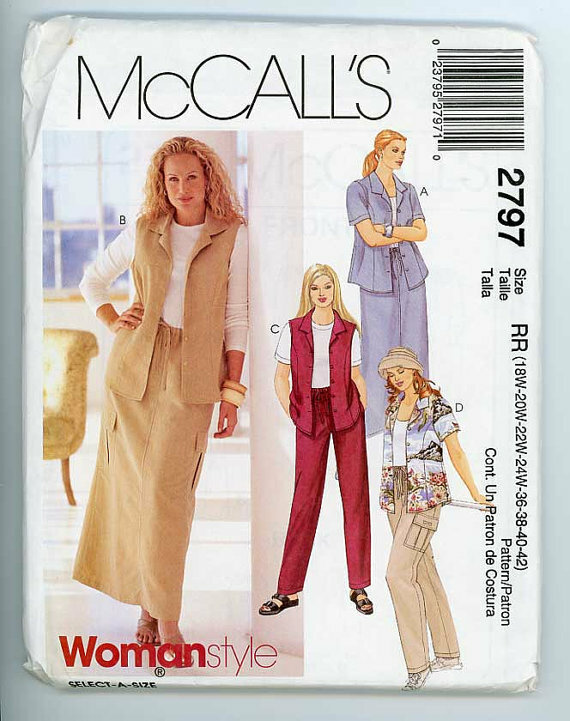 I retrieved the McCalls 6438 (out of print) dress pattern envelope that contained a revised tissue for blouse-making. However, I discovered – too late – that it is not long enough in the front. It definitely needs another 4 inches to account for the extra fabric taken up by my bust. Apart from that, the construction was fairly straightforward. I ignored the shaping of the collar and included some Dark Red satin piping from my stash. This was applied around the collar and also on the sleeve hems. The front and back facings have been top-stitched which will prevent them from ‘popping’ out. 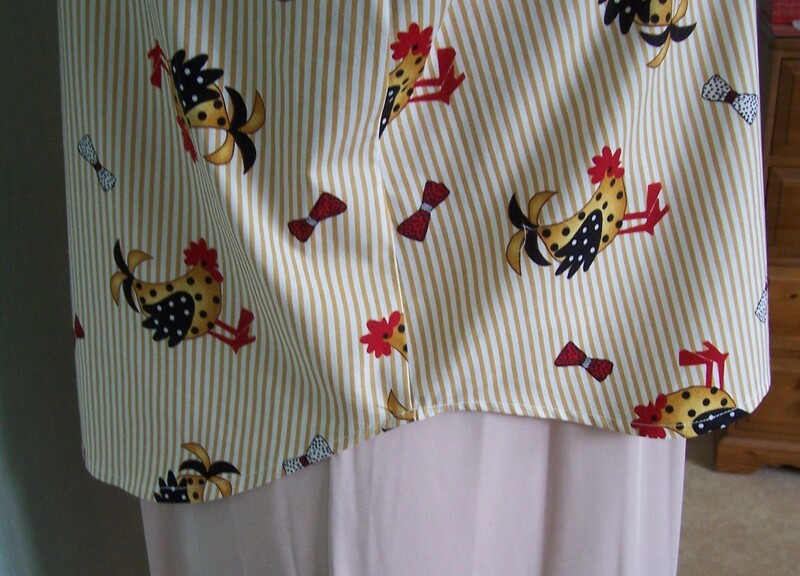 The hem is shaped and top-stitched. I used five 5/8th Rusty Red buttons from my stash which were applied using my new button application machine foot. 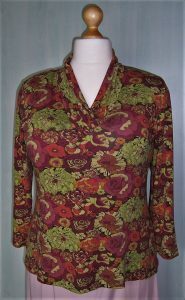 The blouse is very loose so should be comfortable to wear when it is warm but it will never be a favourite. It will probably lurk at the back of my wardrobe for a long time! 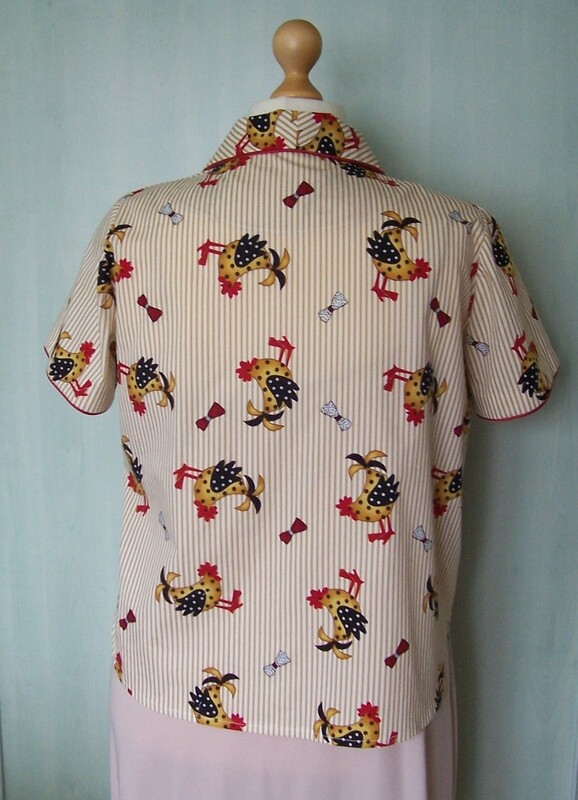 Back view – for the back of the wardrobe! Inspired by all the re-modelling and alterations that my e-mail friend, Antje, in Germany undertakes, I decided to do a little myself. Those of you that know me will also be aware that “I do not do alterations” so this is way out of my comfort zone. 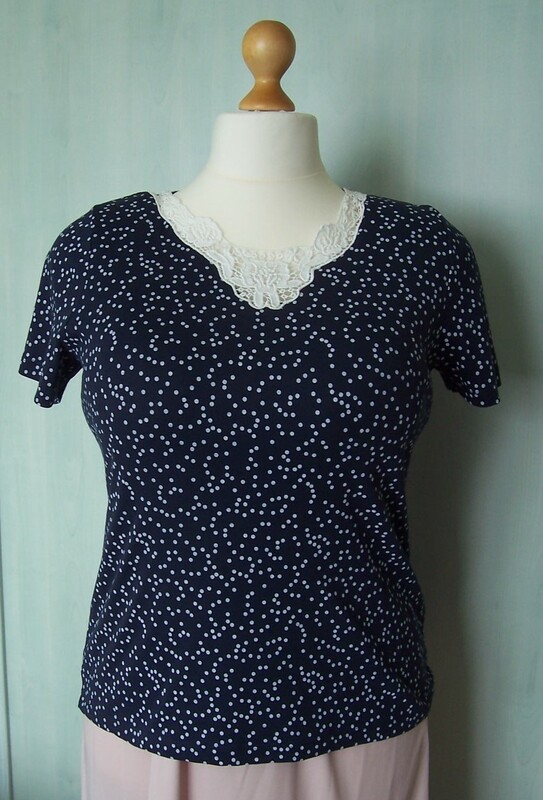 I had rescued a heavy cotton lace neckline insert from an old top and having mended a couple of gaps, thought it would look good at the neckline of a basic Navy & White tee recently purchased from Bon Marche for £8.00. First I pinned the insert to the tee and tried it on. 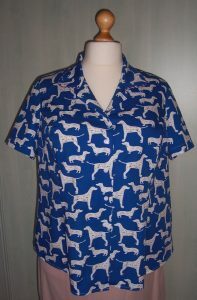 It needed to be placed lower down so that I would avoid stitching over the faux placket detail of the shirt. I then set my machine with white thread in the needle and bobbin together with a narrow zig-zag stitch. The insert was stitched in place and the background of the tee removed. The insert is still a little higher than I would like but overall I am pleased with the result. 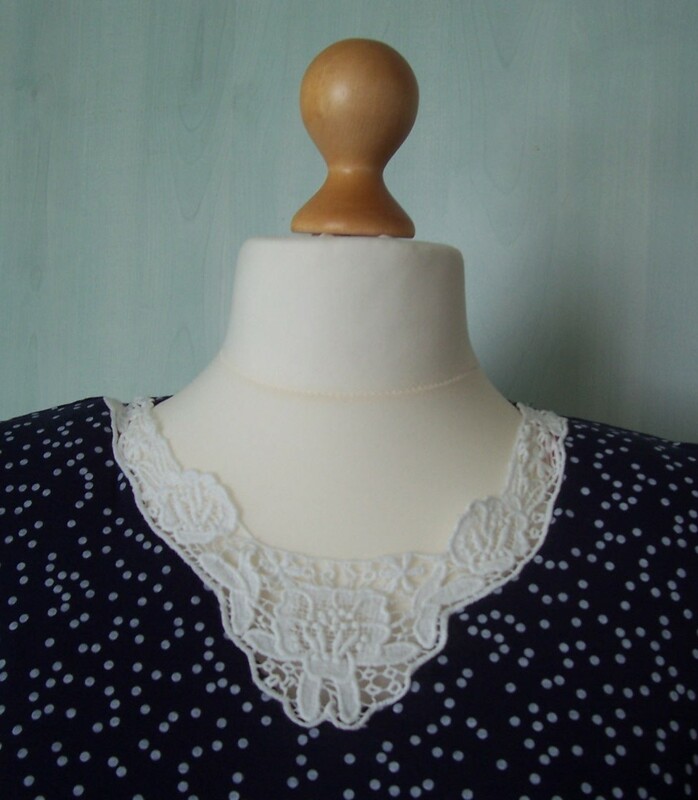 Meantime, I have ordered a selection of heavy embroidered lace inserts from eBay and plan to incorporate them into new tops for the Spring and Summer.